TorishimaGuna engagement in this field dated back in 2005 when receiving Surface Pump Repair Contract from CPI. Since then, the business has expanded to cover pipeline hot tapping, heater, gas turbine maintenance and many others. Our most recent contract was Maintenance and Management System from one of Oil and Gas Company based on East Kalimantan. Under this contract, TorishimaGuna is required to supply experienced and professional engineers to monitor and investigate electrical and mechanical equipments for repair overhaul or replacement if necessary. 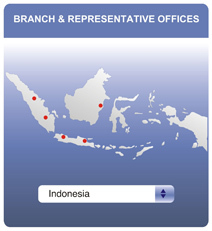 To support the ongoing business, a complete service center was inaugurated in Jakarta in February 2006. API QI Certificate for Service, Repair and Remanufacture of Pumps, Pump Parts, and Pump System was obtained in 2007. Supported with 400 of professional staff and trained technicians, every project will successfully be completed within allocated budget, time and complied specification.